Lynne Arriale Trio, featuring Benny Golson. The fierce heat in Soho Square felt as if we'd just stepped off a plane, but Ronnie's was cool and inviting as ever. Pianist Lynne Arriale looked very cool and composed too, as she played The Nearness of You with delicate restraint, the notes like drops falling into a still pool. The audience was completely silent and focused on every note, and erupted into heartfelt applause at the end. Guido May's luscious drumming was especially sensitive and brilliant here, as it was throughout the gig. Lynne's summery take on the Beatles' Here Comes the Sun had a Jarretty bright gospel feel, and her imaginative arrangements of A Night in Tunisia and Blondie's Call Me (!) , had hard-swinging groovy bass and melodic solos from Geoff Gascoyne. Her mentor ECM pianist Beirach's influence could be heard in her own tunes, the Latin La Noche, and almost flamenco Dance of the Rain. Her pianistic technique recalled Fred Hersch- both have complete dynamic control of each finger separately, so everything is cantabile. Much of her improvising is around the middle of the piano, pared down into the vocal range. Lynne loves the Romantic composers, and this emerged in her lush fast runs, hinting at a virtuosity held in check by putting feeling and sincerity first. 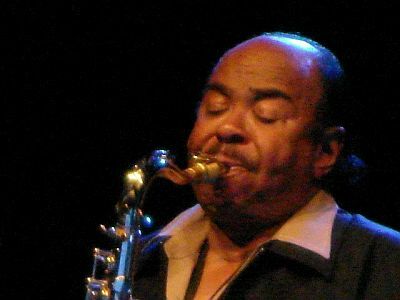 How would this former classical player work together with legendary hard bop tenor player Benny Golson, writer of tunes like Killer Joe? Benny joined the trio half way through each set and brought out Lynne's Wynton Kelly/Tommy Flanagan swinging side, showing what a versatile pianist she is. Stablemates indeed. Benny's playing sounded wonderful- a breathy Ben Webster/ Dexter Gordon tone, a little Lester Young, with some asymmetrical phrasing and atonal runs that sometimes even recalled Eric Dolphy. He has great charm as a raconteur, and at 83 he's experienced - and formed - a lot of jazz history! He played some of the much-loved jazz standards he's written, and introduced each one with an anecdote as if it had happened last week- we felt the premature loss of Clifford Brown with him as he played I Remember Clifford. He was 'validated' as a composer when Miles Davis recorded his Stablemates, and suddenly everyone wanted his tunes. An image sticks in the mind- Paul Chambers lying down with his bass, falling asleep the worse for wear, in the middle of the first recording of Benny's Whisper Not. With Benny Golson and Lynne Arriale the stories were not just told, but also played: a treat to hear one of the founders of modern jazz with one of its new narrators.